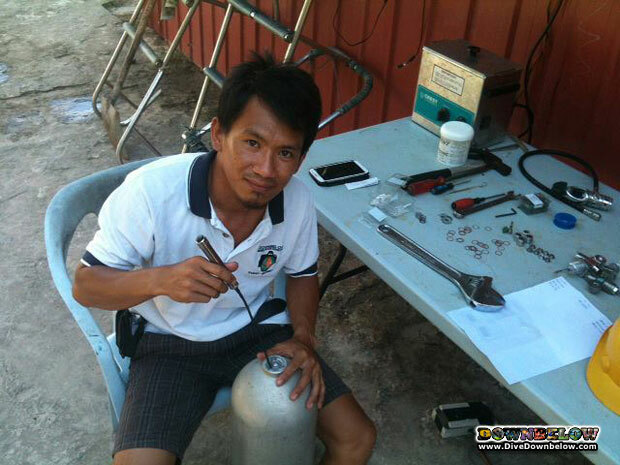 Downbelow IDC Staff Instructor & qualified equipment specialist Welson conducts routine tank maintenance at our PADI 5 Star IDC Dive Centre. Maintaining our extensive range of equipment is one of our daily activities to ensure they remain in tip-top condition and well-maintained for the safety of our guests, staff and students. We have established extensive safety standards and procedures, which are enforced, regularly monitored, updated and tested. Our training courses adhere to PADI Standards and Procedures and UK HSE guidelines. We own all our own vehicles, boats and equipment. That is why when you scuba dive with Downbelow, you scuba dive with peace of mind. Find out more about our safety policies and what we do to keep all of our equipment, boats and vehicles safe and always in good condition.